President Barack Obama urged his Russian counterpart Thursday to embrace a diplomatic solution as Ukraine lurched toward breakup when lawmakers in Crimea unanimously declared they wanted to join Russia and would put the decision to voters in 10 days. In a phone call that lasted around an hour, Obama again told Russian President Vladimir Putin that Moscow's actions violate Ukraine's sovereignty and urged him to instead to support direct talks between the Russian and Ukrainian governments, the White House said. "The governments of Ukraine and Russia would hold direct talks, facilitated by the international community; international monitors could ensure that the rights of all Ukrainians are protected, including ethnic Russians; Russian forces would return to their bases; and the international community would work together to support the Ukrainian people as they prepare for elections in May," the White House said.The call, Obama's second telephone conversation with Putin in two days, came hours after Crimean lawmakers announced their desire to secede from Ukraine and join Russia. Putin's hand was almost certainly behind the dramatic move, but it was not clear whether he is aiming for outright annexation, or simply strengthening his hand in talks with the West. The EU announced limited punitive measures against Putin's government - including the suspension of trade and visa talks - and the U.S. said it was imposing travel restrictions on opponents of Ukraine's new government. Both were discussing further sanctions. In Washington, Obama condemned the planned Crimean referendum, saying it "would violate the Ukrainian constitution and violate international law." Crimea's parliament rammed through what amounted to a declaration of independence from Ukraine, announcing it would let the Crimean people, 60 percent of whom are ethnic Russian, decide whether they want to become part of their gigantic neighbor to the east. "This is our response to the disorder and lawlessness in Kiev," said Sergei Shuvainikov, a member of the legislature. "We will decide our future ourselves." CBS News Moscow bureau chief Svetlana Berdnikova said reports suggested a new bill could be adopted by the Russian parliament as soon as next week, simplifying how regions of foreign states can join the Russian Federation. The State Duma, the lower house of Russia's legislature, was expected to consider Crimea's request in meetings next week. Ukraine's prime minister swiftly denounced the action: "This so-called referendum has no legal grounds at all," said Arseniy Yatsenyuk. The country's acting president, Oleksandr Turchynov, later said Ukraine would move to dissolve Crimea's parliament, but such an action would have virtually no practical effect. As an emergency EU summit got under way in Brussels, a senior Western diplomat, who spoke on condition of anonymity, promised that EU leaders "will send a clear message that the referendum won't be recognized." Later the bloc unveiled its response: EU President Herman Van Rompuy declared that the bloc was suspending talks with Russia on a wide-ranging economic pact and on a visa deal, and would consider further measures if Russia does not quickly open meaningful dialogue. "Not everyone will be satisfied with the decision but I should say that we did much more together than one could have expected several hours ago," said Polish Prime Minister Donald Tusk. On Tuesday, Putin said Russia had no intention of annexing Crimea, while insisting its population has the right to determine the region's status in a referendum. A popular vote would give Putin a democratic fig-leaf for what would effectively be a formal takeover - although it was too early to tell whether such a move would actually go forward. The Russian president called a meeting of his Security Council on Thursday to discuss Ukraine. For Putin, Crimea would be a dazzling acquisition, and help cement his authority with a Russian citizenry that has in recent years shown signs of restiveness and still resents the loss of the sprawling empire Moscow ruled in Soviet times. The peninsula was once Russia's imperial crown jewel, a lush land seized by Catherine the Great in the 18th century that evokes Russia's claim to greatness as a world power. The city legislature in Sevastopol, the Crimean port that hosts Russia's naval base, voted late Thursday to join the referendum. The vote was necessary because the city has an autonomous status making it separate from the rest of Crimea. Crimea's new leader has said pro-Russian forces numbering more than 11,000 now control all access to the peninsula in the Black Sea and have blockaded all military bases that have not yet surrendered. In Washington, Obama sought to follow through on a threat that there will be "costs" to Russia's actions in Ukraine - moving to enact new visa restrictions on an unspecified and unidentified number of people and entities that the U.S. accused of threatening Ukraine's sovereignty and territorial borders. The restrictions were unlikely to directly target Putin. Obama also signed an executive order that will allow the U.S. to levy financial sanctions. In a statement, the White House said the penalties would target "those who are most directly involved in destabilizing Ukraine, including the military intervention in Crimea, and does not preclude further steps should the situation deteriorate." The U.S. measures were announced as Secretary of State John Kerry headed into a meeting with Russian Foreign Minister Sergey Lavrov in Rome on the sidelines of a diplomatic forum about Libya. The Europeans appeared divided between nations close to Russia's borders, which want the bloc to stand up to Moscow, and some Western economic powerhouses - notably Germany - that were taking a more dovish line. EU economic sanctions against Russia could prove painful for Europe as well - since Russia could hit back by turning off the taps to natural gas that is an urgent need for many European countries, including regional giant Germany. The fallout for Europe from any action targeting influential Russian oligarchs or corporations would also be great. Russian investors hold assets worth billions in European banks, particularly in Britain - which is reluctant to undermine its massive financial services industry. Russia, the EU's third biggest trading partner, bought $170 billion in European machinery, cars and other exports in 2012. Yatsenyuk, in Brussels to meet with EU leaders, said Russia is continuing to stir up trouble. "We ask Russia to respond whether they are ready to preserve peace and stability in Europe or (whether) they are ready to instigate another provocation and another tension in our bilateral and multilateral relations," Yatsenyuk said. In Simferopol, Crimea's capital, about 50 people rallied outside the local parliament Thursday morning waving Russian and Crimean flags. Among the posters they held was one that said "Russia, defend us from genocide." "We are tired of revolutions, maidans and conflicts and we want to live peacefully in Russia," said one of the bystanders, Igor Urbansky, 35. "Only Russia can give us a peaceful life." Maidan is the name of the downtown square in Kiev where tens of thousands of protesters contested the rule of Ukrainian President Viktor Yanukovych, who fled to Russia. Not all in this city favored the lawmakers' vote to secede from Ukraine. "This is crazy. Crimea has become Putin's puppet," said Viktor Gordiyenko, 46. "A referendum at gunpoint of Russia weapons is just a decoration for Putin's show. A decision on occupation has already been made." Svetlana Savchenko, another Crimean lawmaker, said the choice she and her fellow deputies took in favor of joining Russia will force Moscow to make a decision. "This is our principled position," she told The Associated Press. "Now the Russian Federation must begin a procedure - will it take us in or not." Rustam Temirgaliev, first vice premier of the Crimean government, said preparations are under way already to bring Crimea into Russia's "ruble zone." "At the present moment, a large, important group of specialists from Russia is at work, preparing to assure the entry of Crimea into the Russian Federation," Temirgaliev said. CBS News' Elizabeth Palmer reported Wednesday that Ukrainian soldiers were refusing to leave their bases and sailors were refusing demands from Russian forces to abandon their ships. Palmer stood on the banks of a bay in Crimea Thursday morning, with the massive hull of a capsized ship protruding out of the water behind her. Ukrainian forces told her they suspected their Russian counterparts had sunk the vessel overnight to block access to the port. 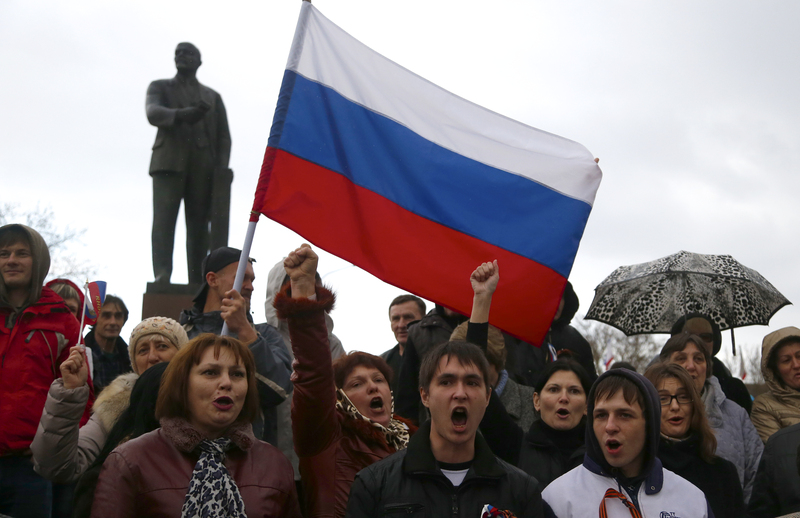 Turmoil was brewing elsewhere in the Russian-dominated eastern half of Ukraine. Clashes between protesters and police broke out early Thursday in the ethnic Russian stronghold of Donetsk as police cleared demonstrators from the regional administration center. The Ukrainian flag once again was hoisted over the building, and about 100 Ukrainian Interior troops could be seen in and around it. Two large trucks were parked in front to block the approach. The Pentagon said Thursday that six U.S. F-15 fighter jets arrived in Lithuania to boost air patrols over the Baltics as the Ukraine crisis continued. A U.S. warship was also now in the Black Sea for long-planned exercises. Meanwhile, the U.S. military will send F-16 fighter jets and service personnel to Poland next week for a training exercise whose scope was expanded in response to the crisis in Ukraine, Poland's defense minister said. Tomasz Siemoniak said the U.S. would send 300 jets but CBS News national security correspondent David Martin reports that the Pentagon and European Command say they are still in discussions about how many planes the airfield can handle. In France, Interpol said it was studying a request by Ukrainian authorities to issue an international wanted persons alert for the arrest of Yanukovych for abuse of power and murder. At a news conference in Kiev, representatives of the Organization for Security and Cooperation in Europe, returning from Crimea, expressed concern the referendum might stir up new clashes and provocations. "The situation might seem quiet, almost normal if you go to the streets," Tim Guldimann, the personal envoy of the Swiss OSCE chair, said. "However, it's extremely tense and I would consider this as a miracle that bloodshed could be avoided so far given the political and even military circumstances on the ground."